I clicked yes, and do you know what happened? There are dots on the picture, just like pictures on newspaper. Then I thought, “Now, the picture is not nice,” so, I clicked undo…and the picture changed into a picture that looks like a painted picture! It was exciting! I have never been to a field trip with my schoolmates before! 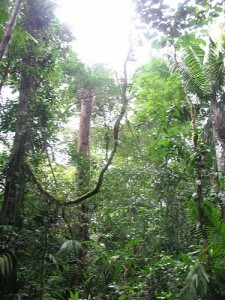 I went to FRIM (Forest Research Institute Malaysia) on 26 July 2008 with my school as a field trip. I learned about the trees and plants over there. It was fun, I had to hike. It was tiring but fun . Unfortunately, I did not see any animals (they must be sleeping). So, we (me and my schoolmates) got in the bus, and the bus stared moving. It is a long ride. On the way there, I saw my old house area. Finally, we arrived at FRIM. After coming down, I had nasi lemak, a kind of spicy Malay food. After we eat, we lined up in four lines as teacher said. Then two female tour guides came and introduced themselves. We were divided into two groups. So, we began our hike through a high hill (more like a small mountain). It was tiring (because I took my bag up with me), but fun. 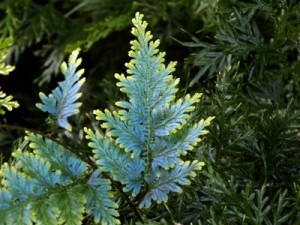 On the way, my group’s tour guide showed us a blue fern and told us that it reflects sunlight. So, it is blue. The parts that are not affected by the sunlight, stays green. The tour guide also explained about the liana tree. Local people call it ‘Tarzan’ tree. She explained that there is water inside the tree. After that, we went into a small path, you have to walk up the hill (there are rocks and planks as ladders. You have to take huge steps to go up). It was very tiring because walking up is pushing yourself up each step. At least we got to rest when we are hiking . 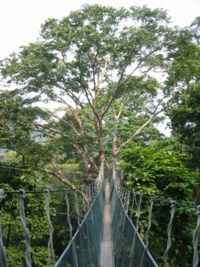 Soon, after the huge steps, we arrived at the canopy bridge. We had to queue up to walk on the bride because the bride can support only a few people at a time. It was a long queue. But I just couldn’t wait to walk on the bridge! How exciting it would be! I waited and waited. And finally, hello, bridge! I walked on the bride carefully. I am not afraid of the heights. It is more exciting than scary; more like an adventure. I loved to look down and see how high the bridge is! I reached a spot where you can see a beautiful view of a part of the town. Finally, I got down from the bridge and continue hiking; down this time. So, we got were hiking down, to another part of FRIM, it is part of the hill, too but it looks more like a forest this time and we don’t have to take huge steps because we are not going up. The tour guide first explained about the common fern and the giant fern, and tells that it reproduces by spores (we had already learned this in class). The common fern has spores on its bottom while the giant fern has spores on its sides. After that, we went in the area and the tour guide explained about the ficus tree. Its roots could store water and they are strong, too. Then, we saw the jelutong tree. It is the tree that we use to make pencils because the wood is light and strong. 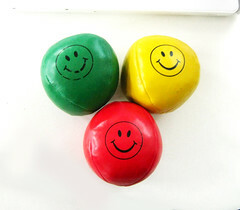 It has rubber, too; in which we use to make chewing gum. Next stop is the camphor tree. Its leaves smell like mangoes and its trunk, ointment. After that, we headed to the elephant tree. Its roots are shaped like an elephant’s head. Too bad I didn’t get a photo of that . The tour guide explained about more trees, but there are some that I can’t remember. It was fun there too. We got to see a big fish and turtles at the pond. We said bye to our tour guides. I learned a lot there. After that, we followed our teacher to the cafeteria. We had lunch. I ate rice with a salty egg (I love salty eggs). I talked to my friends, ate ice cream. After that, teacher led us to a place near a waterfall (in FRIM) where some people went swimming. We watched the people swim and rested. Then, we went to visit the traditional houses of Malaysia. Too bad we are not allowed to get inside it. Finally, we got in the bus to go back. The bus has a TV on it, and I watched a movie . And the effect is carsick (rather bus-sick) . I was feeling uncomfortable and tired. Finally, I arrived at school (you arrive at school before the drivers take you home), good thing too. I got a free chrysanthemum drink from teacher (it cured my carsick…or bus-sick). The oxygen also made me feel better. But I was very, very tired. So, I rested on a bench, and almost slept! 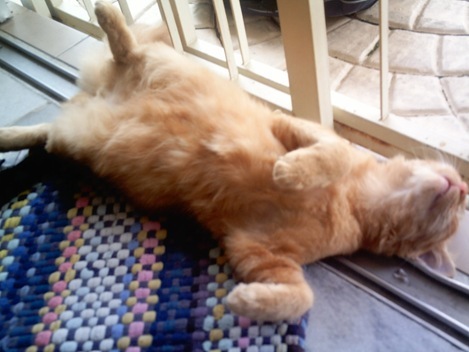 Luckily, my friend woke me up…by walking out of school when I opened my eyes. So, I finally decided I’d cycle back home (I cycle to school). I liked everything (except the bus-sick part), but I liked the canopy bridge the most. You feel like you are walking on air! I loved to look down (I mentioned this earlier). You feel like you are going through an adventure! Next, I like the walk through the forest part. I loved to see the trees and hear the tour guide explain. I also loved the part when the tour guide asked us to crush a leaf from a camphor tree. It really smelled like mango, while the trunk smelled like oil. I also liked the part where I took big steps . It was really tiring but really fun, too. I liked the part where I drank spring water. It tastes like normal water but is nicer and colder. I WISH I CAN GO TO FRIM AGAIN! Ok, this is how I started. I began writing poems after I read some funny poems from the internet. I wanted to write poems like the poets too. So, I started. At first it was hard to think a funny idea to write it. I thought and I thought and I thought. But I finally thought of one and wrote it. It is titled My Rotten Day. The day after I wrote it, I wrote another poem in school titled A Birthday Indeed. When I arrived home, I wrote another poem titled My Confession. From that day on, I continue writing poems. But how did I learn how to write them? From school, of course! But how did I succeed? Why didn’t I fail? The answer is simple: You keep on writing. You don’t give up. When you stop writing, you fail. You don’t stop writing just because someone says badly about your poem. You keep on writing. You keep on going. Then you succeed. When you finish writing your poem, don’t look so gloom and depressed. Praise yourself! Yes, that will make you happy and satisfied. Don’t ‘trash’ your poem. You know you can always modify it to make it better. Some poems you are not satisfied with are a satisfaction to other people. In other words, the poems you think that are no good, are good to other people (while some are no good to them). One fine day I realized that the poems I write now are better than the ones I wrote before. This means that if you use your talents, you will have more. And if you say you don’t have talents, you will have none. How do I get funny ideas? I think! First, think of something funny to write about a subject. Then, add a funny ending. For Example: My dad cooks very badly and burnt our food so he was forced to order pizza for us! Finally, make the story into a poem! One more thing: Write down the idea to your notebook or computer so that you don’t need to spend much effort remembering them. Where do I get funny ideas? Sometimes I think, sometimes the idea just comes to you. Sometimes, thinking of it is easy; sometimes, it’s hard. Now, you think what’s funny, absurd, or unique about them. Hmmm… Let’s start with…Escaping from school. Now, what’s funny or surprsing about escaping from school? Your teacher punishes you (of course, when you accidentally bumped into your teacher)! Aha… That was a good one. You can make that a funny ending. Now, when you talk about that, you may go to other subjects with a funny ending involving escaping from school. After that, WRITE YOUR POEM! There, a funny poem! Did you laugh? Well if not, then at least it made you smile or happy. How do you write exaggeration poems? Exaggerate something to make it much more or much less than what it is. The world’s highest skyscraper; it is higher than you think. The fastest tortoise on Earth; it runs fast as you can blink. The slowest hare in the world that’s slower than a snail. The proudest fox in the world which has a big, long tail. The best singer in the world; she makes people’s hearts melt. The loosest trousers; you can’t hold it with the strongest belt. The smallest building; you see it with magnifying glass. The shortest man in the world or maybe the tallest grass! Well, that rhymed didn’t it? Okay, let’s focus on the title The World’s Highest Skyscraper. Now, you create the details (describers of the main idea). What can the world’s highest skyscraper have or do? Well, it reaches beyond the sky. It has many, many floors. It can hold many people. Now, the last thing to do is to add a funny ending. Now, you can make it what a person doesn’t expect it to be, the funniest thing about the subject, or something else funny (Well, see whether you could guess the funny ending for my next poem). You are then ready to WRITE YOUR POEM! it is very strong too. it won’t fall on me and you. it has more than a million floors! It has ten million doors! You don’t necessarily need to think of a funny ending before you write a poem. Just start to write your poem and the funny ending will just come to you soon. Sometimes, if you think of a funny beginning like ‘A thin pig and a fat baboon jumped across the crescent moon’, just scribble or type it down in your notebook or computer. That could be the very beginning of your very funny poem! Words can also make your poem funnier or more exciting. The boy snatched my pencil sounds more exciting than the boy took my pencil. The witch cackled and cackled sounds funnier than the witch laughed and laughed. When my mother sees me, she cuddles me sounds more tender than when my mother sees me, she hugs me. Use your thesaurus to help you find synonyms to make your poem better. And by the way, please look up the definition of the new word that you picked from the thesaurus as its meaning may vary. There are many, many kinds of poems. 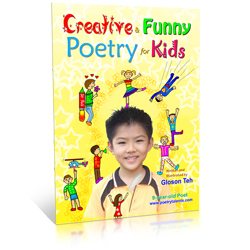 There are limericks, couplets, diamante, haiku, rhyming, non-rhyming, free verse, and many more! One more thing: How you write a poem is like how you build a building. First, you must plan it (the subject and the details). Then, you build it (writing the poem). Finally, you paint and decorate it (modifying it to make it better). Well, sometimes I ‘finish’ writing a poem, but later I found out that it can be modified to make it funnier or better. I never knew that it can be modified for the better. And one more thing: Remember to be patient, and do things one step at a time. The more you write, the better your poems will be. The answer is: One bite at a time. And Now, Have Fun Reading! First, you bring out all the things. Next, you lay them all down. then, lay the fish around. then put some bright lights on. on a quite large plastic dish. a rest is what you need. You’ll have a cat stampede. I crept out of the room. out of school; you could tell. to the smell, faster and faster. and it was the headmaster!